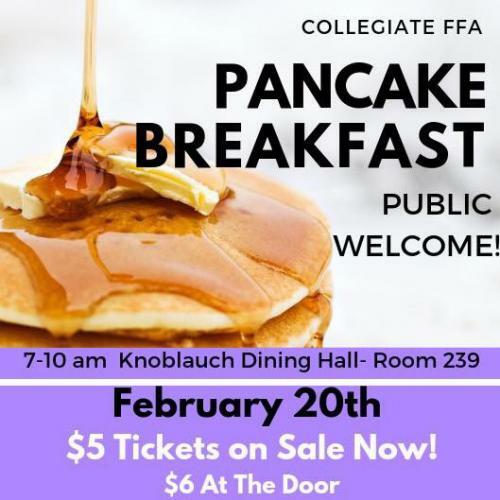 MACOMB, IL – The Western Illinois University Collegiate FFA (CFFA) chapter will host its semi-annual fundraising pancake breakfast from 7-10 a.m. Wednesday, Feb. 20 in the Knoblauch Hall, room 239. Twelve members of the chapter will serve pancakes, biscuits and gravy, sausage, milk, orange juice and coffee. Tickets are $5 in advance from any CFFA member or in the School of Agriculture office in Knoblauch Hall, or $6 at the door. On-campus delivery of five or more orders is available. This is one of CFFA's fundraisers each year. The chapter competes at the state and national level and helps with the University's Greenhand Conference, an annual, agriculture-related event in Macomb for students from nearly 35 high schools. For more information, contact Brandon Livingston at BA-Livingston@wiu.edu.